I now have around 2000 rounds through the MGI QCB-D upper receiver, and I must say, all trouble free, as far as the upper goes. All rounds were in full auto on the M16. 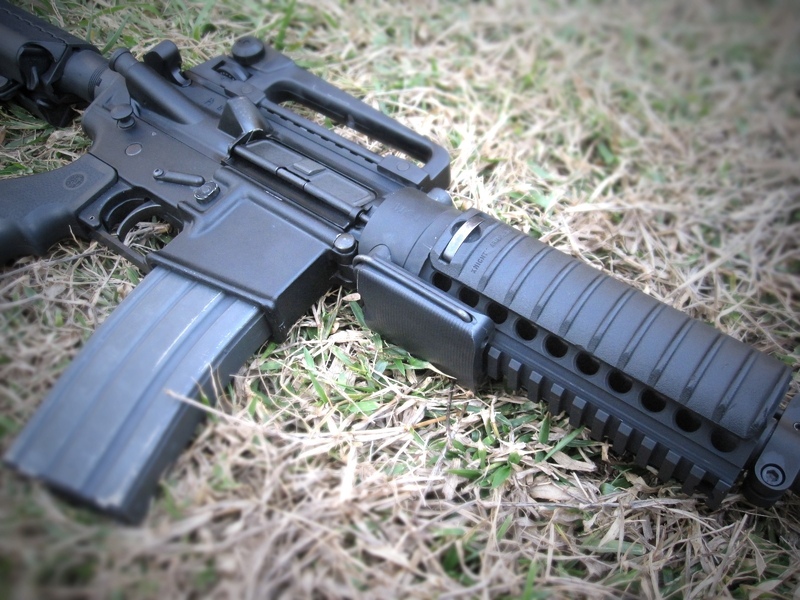 The upper has really proven to be a very useful, versatile add-on to any rifle. The ability to unlock a hot barrel, “shake it out” of the the receiver, and install a new one in no time at all is very handy. I’ve only had 2 different barrels in the upper, a White Oak Armament 10.5″ and a 7.5″ from a DPMS Kitty-Kat. Both fit well, locked in snug and performed flawlessly. The 7.5″ did require a low profile gas block. 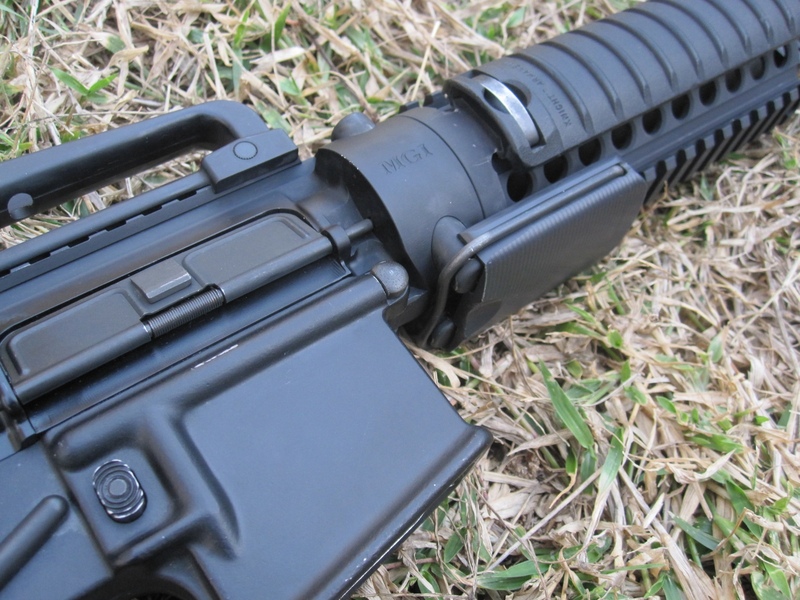 When installing barrels in the MGI upper, the hand-guard cap needs to be omitted. 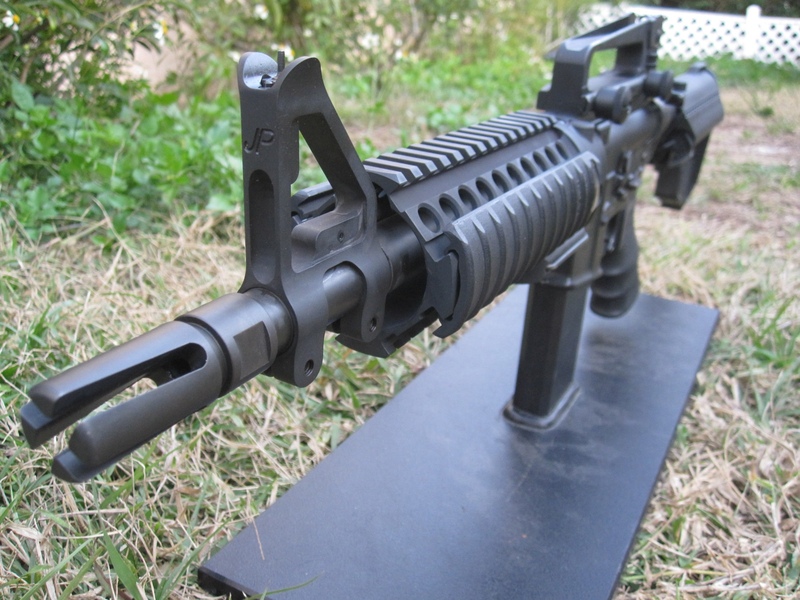 The barrel extension flange is what the MGI upper locks on, and if it isn’t within a few thousands of .131″ (Rock Island Arsenal blueprints) locking issues may occur. I found that the barrels I installed to lock up tight, with the exception of a new 7.62×39 YHM barrel I purchased. The flange on it measured .127″. While this will not an issue on a standard barrel nut setup, it is too thin for the MGI, and the barrel will still be loose after installation. The barrel could literally be rocked back and forth, with an extension only .004″ out of tolerance. MGI can adjust the tension on the locking cams if desired, but an in-spec barrel extension will then be too thick, causing locking issues as well. I found the rails to be as good as any, I mounted an EOtech on it, as well as an ACOG without any issues. I did end up just using a carry handle on there as a sight. The rails not in use were covered with Knight’s Armament rail covers. These can, by the way, be locked on non-KAC rails by gently prying the tab up with a small screw driver. The biggest downside I see from the MGI QCB-D upper is the inability to mount anything to the bottom rail. Ideally, the sliding lock needs free movement to function, so covering the rail section in front of it renders the whole system useless. Of course, anything can be removed, especially a nifty LaRue or ARMS disconnect vertical front grip, or a light with quick disconnect, but it’s an extra step, with more loose items laying around to keep track off. I really think that a slider with a rail cover section on it, to protect the hand, would be an addition, or even a slider assembly with a VFG integrated to it. Perhaps MGI can get with Magpul for a custom Angled Grip. Corey at MGI Military was right, I do love this thing, and I will continue to use it extensively.